Takahashi FSQ-106ED @ f/5.0 (530 mm FL) Captured at 3.5 arcsec/pixel. Shown resampled to 17.9 arcsec/pixel. 50-50 blend of LRGB & HaGB + an additional overlay of star colors. 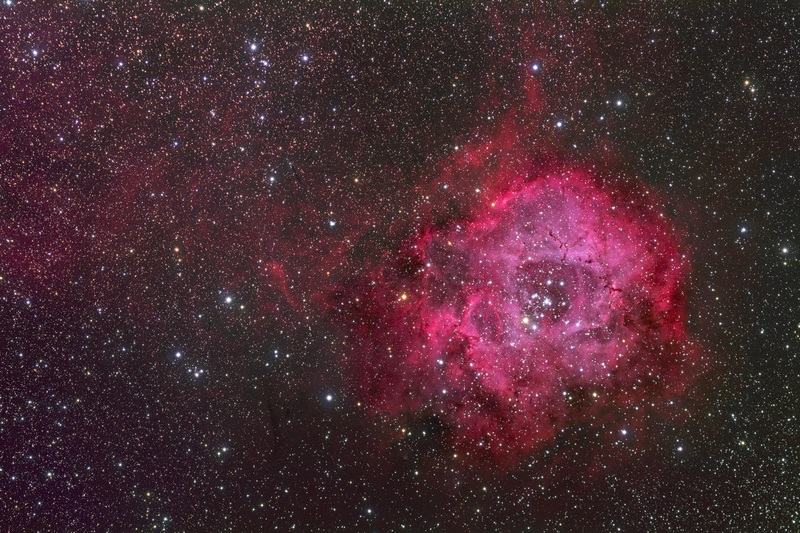 The Rosette Nebula is a large, circular hydrogen region located near one end of a giant molecular cloud in the Monoceros region of the Milky Way Galaxy. The open cluster, NGC 2244, is closely associated with the nebulosity, the stars having been formed from the nebula's matter. The Nebula is about 100 light-years across and is about 5000 light-years away. The nebula can be seen with a small telescope using low power. With binoculars the wisps of the nebula become clearly visible, if observed under very dark skies.